3.4 Where do we go next? Mid-Michigan Energy, a subsidiary of Dynegy / LS Power, has cancelled a proposed 750 megawatt (MW) plant near Midland, Michigan. "Making this decision has been especially difficult given the strong support we have received for the project in the local community," said Robert Colozza, vice president for LS Power. Joy Buchanan, local spokesperson for LS, said it's unlikely LS will try again in Midland. "It would be very hard to come back," she said. "You can't just come back in. You have to get your permits again, you would have to go through the zoning process (again) with the city." The company had originally planned to begin construction in 2009. Mid-Michigan had submitted air pollution and construction permit applications to the Michigan Department of Environmental Quality. Cost estimates for the plant had risen from $1.3 billion to $1.9 billion because of increases in construction and labor costs. Most recent, credible cost estimates for the plant came from the company's filing with Midland City Council in December of 2007. The plant was to be sited adjacent to Dow Chemical's Midland plant, the world headquarters of the chemical giant, and near Dow Corning, a Dow Subsidiary. The Midland plant was included in a Sierra Club campaign to urge Dynegy and LS Power to abandon proposed coal-fired plants in six states and instead focus on cleaner energy projects. In July 2008, Mid-Michigan turned in its revised MACT determinations to the Michigan DEQ after its first draft was rejected. MYTH: The three major companies (Dow, Dow Corning, or Hemlock Semiconductor) in the area need LS Power and will be hurt by its demise. 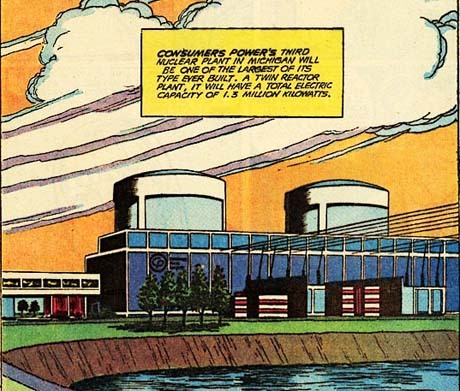 FACT: In fact, all three companies certainly analyzed the economics of this plant, and yet, none decided it was in their best interest to negotiate a contract with LS Power in order to ensure that it remained. The plant was proposed with the idea that Dow, Dow Corning, or Hemlock Semiconductor would be customers. Without the commitment of these customers, the project failed. MYTH: The demise of the LS Power project is bad news for Michigan’s energy increasing needs. FACT:The project was not needed. Thanks to advances in technology reducing energy needs as well as conservation efforts, the future energy needs of Michigan (and elsewhere in the US) are not increasing. The Wall Street Journal recently reported that electric demand is dropping all over the US, and not just due to the recession, but to permanent changes in technology, efficiency, and electric use. This is true here in Michigan, as Consumer Energy and DTE’s latest demand forecasts show a drop coming over the next 10 years. MYTH: Viable, much needed energy projects are being killed by Governor Granholm’s recent energy initiatives. LS Power is suggested to be one supposed casualty. FACT: LS Power’s coal plant was not a viable project. LS Power’s partner, Dynegy, obviously surveyed the landscape carefully, and quit the project a month before the Governor delivered her new proposal. (smart money showed what it thought of coal - by raising Dynegy stock 19% the day after its move) Governor Granholm’s initiative merely emphasize and help make clear what most already know: coal is not a viable energy source. MYTH: The withdrawal of LS Power is bad for Michigan’s economic recovery and job growth. FACT: LS Power promised very few permanent jobs for the cost of its investment (about 100 jobs). Many more permanent jobs can be (and will be) achieved through technologies that have lasting power and build on the future (not the past). In states that have adopted environmental friendly policies, job growth is improved. The world has begun an energy revolution that Michigan has the potential to lead. Michigan’s offshore wind potential equals 10 times our current capacity. We have the manufacturing base, transportation, and work force to immediately become a strong player in an industry that created 17 billion dollars in economic activity, 35,000 new jobs last year, and is growing at a 50% annual rate. Already in Michigan, we are seeing the benefit of the recent energy initiatives. The withdrawal of the Midland coal plant proposal (and others like it) is good news for Michigan’s economy. MYTH: LS Power project failed because Michigan’s environmental regulations are unfriendly. FACT: Michigan’s environmental regulations are very friendly to most new projects and business. Other companies with non-coal related projects have had no problems applying and meeting environmental standards in Michigan. The reality is that coal does not and cannot meet even Michigan’s modest environmental standards. MYTH: LS Power’s project’s air permit was unreasonably held up in the Michigan DEQ through no fault of LS Power. FACT: Amongst other difficulties, LS Power failed to provide mercury release numbers to the Michigan DEQ despite repeated requests for this information. Other companies have been able to meet this requirement satisfactorily to at least move forward to the hearing stage. The DEQ even held hearings recently for one coal proposal (Consumers Energy in Bay City). This data should be readily available and was not an unreasonable request on the part of the DEQ. They were simply doing their job. MYTH: Everyday citizens raising reasonable concerns about the plant killed the project. FACT: A strong, community-friendly project would have no trouble assuring the local residents. A project that is in the best interests of its local community would encourage their future neighbors to raise questions and to challenge it to the best of standards. Such projects would not need to threaten nor intimidate their prospective new neighbors in order to be accepted into their community by suggesting that their employers would not want them asking questions or that their jobs and livelihoods might be at stake. MIdlandCares members Greg and Nancy Janoch have compiled a list of 'Lessons Learned" from this process for Coal activists. -The hazards of coal plants are still there and they will never change. -Resulting healthcare costs (premature deaths, asthma, respiratory illnesses and complications, heart attacks and strokes....etc.) will always be borne by the citizens. Power companies and communities who encourage coal plants pay nothing towards the high costs to those who suffer. -Waste is a huge, unspoken problem - in quantity and resulting pollution - unregulated. -Find help from others who have fought plants. -There are viable alternatives to coal plants available now! -The government is still paying for failed nuclear plants that were never built in the 1970's and 1980's, because power demand did not materialize and the construction costs were so faulty and over budgets. -Bruce Nilles (Sierra Club - AlterNet Dec 16, 2008) : Coal plants cost billions to build and require bank loans. Banks expect us to buy power for decades at high enough prices to cover operating coast and pay back loans, and prices will be higher for more pollution. When energy demand drops companies that build risky plants either default on loans or raise prices. Therefore, higher prices hurt residential customers and industry and make the location an unappealing place to live and have a business. -Consumers Energy tell customers they could buy "Green Power" for 2¢ more per kwh. However, in TX, customers had the choice to buy wind generated power.... At first, it was more expensive, but later, the wind power was cheaper, and customers were charged less. In our present system here, Consumer's Energy are making people think that no matter what, renewable energy is more expensive. -The Great Depression was ultimately turned around by the government's mandate to turn industry to the "war effort". If failing industry can be turned to manufacturing the new phases of renewable, alternative energy, our economy will have a chance to recover and prosper. -Xcel in Colorado was told to meet an RPS. They fought the issue, but later, not only exceeded the goal by wind generation, but found they could generate power more cheaply and became great proponents of wind power. -Wind now and more solar later. Phase out coal and nuclear totally. -Begin more EDUCATION about all topics. -ADVERTISE real solutions and success stories to get the word out to the general public and reduce overall fear. -Start resource team for those fighting zoning issues. -Meet with more politicians and legislators. Reduce their fears and help them form new "networks" of people who support renewable energy. -Educate about the need and possibilities and benefits of a new grid and how to get it done! Midland Resident Peter Sinclair, an outspoken critic of the plant proposal, and a local Climate Change activist, reacted to the cancellation in a letter to local papers. The recent demise of the LS Power coal project in Midland has been blamed on citizens raising reasonable concerns about the plant. The facts show this is incorrect. The plant was obviously proposed with the idea that Dow, Dow Corning, or Hemlock Semiconductor would be customers. In fact, all three companies analyzed the economics of this plant, and all decided it was not in their best interest. Unable to attract customers, the project failed. 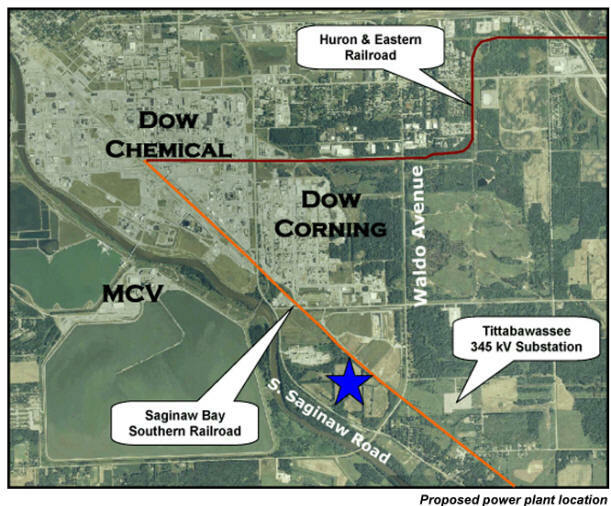 So, if coal is not economical for Dow Chemical, yet we are told that a nearly identical Consumer's Energy plant, in Bay City, would somehow make sense for ratepayers? Coal is unnecessary, expensive, and a dying industry. Pursuing it will mire Michigan in the past. The Wall Street Journal recently reported that electric demand is dropping all over the US, and not just due to the recession, but to permanent changes in technology, efficiency, and electric use. This is true here in Michigan, as Consumer Energy and DTE’s latest demand forecasts show a drop coming over the next 10 years. Instead of building an expensive new coal plant that may not be needed, why not use resources we already have? Michigan CoGeneration Venture, (MCV) in Midland, is a 1500 Megawatt gas turbine power plant, almost as large as both the proposed LS and Consumer’s plants, combined - with plenty of room for expansion. It is one of several large gas turbine plants in the state, available to produce reliable base-load power, if needed. MCV and the others have been underutilized over the past decade, due to the high price of natural gas. Due to new discoveries, gas prices are currently dropping, and are predicted to remain low. Buying power, if necessary, from MCV, instead of raising rates for new construction, means ratepayers could be shielded from high costs of unnecessary construction. Since gas produces only a little more than half the CO2 of coal, costs will be lower to meet regulations that will eventually be applied to all carbon fuels. Meanwhile, the world has begun an energy revolution that Michigan has the potential to lead. Michigan’s offshore wind potential equals 10 times our current capacity. We have the manufacturing base, transportation, and work force to immediately become a strong player in an industry that created 17 billion dollars in economic activity, 35,000 new jobs last year, and is growing at a 50% annual rate. The common objection, “What do you do when the wind stops blowing?”, is baseless. Wind energy can be stored in the Ludington Pumped Storage power plant, and available when the wind stops blowing. As we upgrade our electrical grid over the country, a web of interconnecting wind sites will insure that power is constantly available from wind that is always blowing, somewhere. Michigan also has huge geological storage capacity, that could be used to store renewable energy when it is not needed, as compressed air. States, and countries, that learn to power themselves with unlimited free energy will be winners in the new century. During the crisis of World War II, the nation turned to this state to become the arsenal of democracy, and provide the hardware that saved the world from tyranny. Now, a new, even more critical turning point is upon us. It is time for Michigan to lead the world again. 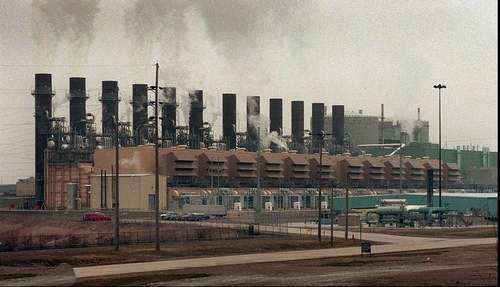 Midland has a history of stormy controversy in regard to power plants. 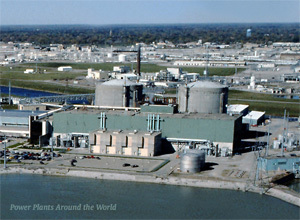 In the 1970s, Midland was the intended site of a large nuclear power project. Citizen's groups raised a legal challenge to the plant, and poor construction practices caused delays and price increases. The project was abandoned in the 1980's, in favor of a gas turbine generator, which operates today as Midland Cogeneration Venture (MCV). The battle split the community, and many conservatives still feel bitterness over the plant's cancellation, blaming radical environmentalists for the fiasco. The controversy garnered international attention, as local activist Mary Sinclair was featured in the Wall Street Journal, and profiled on the 60 Minutes program. One of the high profile organizers of demonstrations against the plant was a young Micheal Moore, then editor of an alternative newspaper, the Flint Voice. The Midland Co-Generation Venture (MCV) is a 1500 MW natural gas facility. After the failure of the Nuclear project, MCV was constructed to help supply base load power as well as steam and electricity to Dow's facility. The project has been operationally sound, but has bounced among several owners over the last 2 decades. In March 2009, a new sale of the facility to a Swedish/American partnership was announced. According to CEO Rodney Boulanger, the new owners have "a lot of ideas on how they can come in and support MCV, everything from just improving its operations to focusing on new green investments to expanding MCV." Because MCV is a relatively low carbon energy source compared to a coal-fired power station, (a natural gas plant releases about 55 percent of what an equivalent coal plant would release), many observers believe that MCV, along with several other Michigan plants like it, may become critical elements in transitioning to a low carbon, renewable regime. Over the last decade, prices of natural gas have risen sharply, and gas turbines were removed from base load service and relegated to the status of under-utilized peaking plants. As the price of new coal plants, and coal itself, has soared in recent years, gas prices have leveled off and dropped. This presents an opportunity to avoid building new coal plants, using existing, paid for, gas turbines like MCV, to fill increased base load power needs, if any. In December 2008, Dynegy CEO Bruce Williamson announced that the company was reevaluating its role in developing new power plants, including Midland. Williamson cited the tightening credit markets and difficulty in permitted new coal plants as reasons for reconsidering its involvement in the siting, permitting, financing and construction of several new projects. Other plants include the Longleaf plant in Georgia, LS Power Elk Run Energy Station in Iowa, Plum Point Energy Station in Arkansas, Sandy Creek Plant in Texas, West Deptford Project in New Jersey, and White Pine Energy Station in Nevada. As an alternative, the company will look at adding generation to its existing sites in the Northeast, Midwest and Western U.S.
Then, in a news release on January 1, 2009, Dynegy announced it was ending its partnership with LSPower in the Mid MIchigan Energy Project. Signs of trouble had been emerging for months between the partners, Dynegy, and LS Power. In August, 2008, Dynegy chairman Bruce Williamson, who has publicly supported government action on CO2, stated that he expected a "lull" in new coal plant development. On December 11, 2008, Reuters reported that in a phone call with investors, Williamson stated that in light of high costs and difficulty permitting, the company was "reconsidering" coal projects around the country, including the Mid-Michigan plant. According to the news item, "Dynegy's reevaluation includes activity related to siting, permitting, financing and construction of at least six coal or natural gas projects.."
Reaction from the local communities and citizens was immediate. MidlandCares, the leading citizen's group questioning the plant, praised the Dynegy announcement. Officials of LS Power, Dynegy's partner in the project, expressed optimism that the project could still be completed. "LS Power has a very long-term view on energy needs and energy generation, and it believes the Midland project is still very viable," a spokesman said. "They are continuing all development activities pertinent to this power plant. Environmentalists were cautiously optimistic that this was further evidence the project may be collapsing. Bruce Nilles, director of the Sierra Club's national effort to block development of new coal-fired plants, stated, "They've seen the writing on the wall ... It indicates that 2009 is going to be a very tough year for the coal industry". Locally, LS Power official Joy Buchanan expressed continued confidence in the viability of the project. "I don't consider this a setback at all," she continued. "We were not engaged at all in any day-to-day activities with Dynegy." Janea Little of the environmental group MidlandCARES called Dynegy's pullout "great news" but doesn't think it's necessarily the end of the project. "LS Power has made it pretty clear that if they have a customer base, they will be going ahead with the project," she said. Dynegy stock prices rose 19 percent on the news, shooting from 2.00 to 2.38, after dropping 72 percent last year. "Tell Governor Granholm, Renewable Energy is Michigan's Future". ↑ LS Power suspends coal plant project"Cheryl Wade and Cathy Nelson Price, Midland Daily News, May 1, 2009"
↑ 2.0 2.1 The Mid-Michigan Energy Project, Mid-Michigan Energy, accessed December 2008. ↑ Summary Report to Manager, Midland City Council, December 3, 2007. ↑ Natural Gas, Wind could power Michigan"Peter Sinclair, The Saginaw News, May 18, 2009"
↑ Granholm Firm on Vetting Coal Rush"Jim Dulzo, Michigan Land Use Institute, April 6, 2009"
↑ Dynegy Ends Coal Plant Venture with LS Power"Reuters, January 2, 2009"
↑ Dynegy to Dissolve Development Venture With LS Power"Jim Poison, Bloomberg News, January 2, 2009"
↑ Surprise Drop in Power Use Delivers Jolt to Utilities"Rebecca Smith, The Wall Street Journal, November 21, 2008"
↑ Consumer's Energy Load Forecasting"Consumer's Energy, November 18, 2008"
↑ "Delaying Nuclear Power," Time, September 13, 1971. ↑ "Midland Plant Shift to Gas," New York Times, February 1, 1986. ↑ Mary Sinclair, Michigan Women's Hall of Fame, accessed December 2008. ↑ "A Lone Tree for vigilance," Saginaw News, April 22, 2007. ↑ Swedish, American partners to buy MCV"Cheryl Wade, Midland Daily News, March 20, 2009"
↑ "Officials urge utility to back off Ely plant" John G. Edwards, "Las Vegas Review Journal" August 13, 2008. ↑ "Dynegy to rethink new coal-fired power projects" "Reuters" December 11, 2008. ↑ "Power Plant Kaput?" "The Saginaw News" December 13, 2008. ↑ Local Group Supports Dynegy in Rethinking Investments in Coal Plants, MidlandCARES.org, December 16, 2008. "Battle Brewing Over Michigan’s Utility Choice Law", Bay City Times, December 10, 2007. "They Want to Build A Coal Plant in Midland!? ", MidlandCares.org, accessed January 2008. Clean Up Dynegy - Stop U.S. Coal-Fired Power Plant Polluter #1, Sierra Club campaign, accessed June 2008. This page was last edited on 30 May 2010, at 19:41.